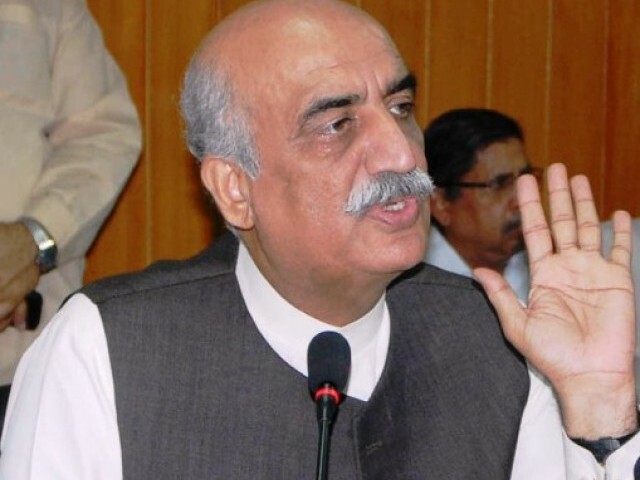 ISLAMABAD (92 News) – Opposition leader Syed Khursheed Shah has said that Prime Minister Nawaz Sharif should play a role to resolve differences between military leadership and Pakistan People’s Party. Talking in a 92 News programme “Hum Dekhain Gy”, Khursheed Shah said that PPP co-chairman Asif Zaradri emotionally gave statement. He said that Pervez Musharraf along with all his companions who took part in throwing Nawaz Sharif’s government should be prosecuted. Opposition leader said that all political parties had differences over military courts but it was PPP co-chairman Asif Zardari who resolved those differences. “Interior Minister Chaudhary Nisar had praised that openly,” he said. Khursheed Shah said that we can take two steps back for the sake of country but do not push us with the wall.